The Maxx Model TE-PRO hopup chambers are precision CNC machined from a solid block of aircraft grade aluminum with tight tolerances for greatly improved accuracy, consistency, as well as durability. Unique to this hopup design is a latching system which engages when the magazine is removed to retain the last fed BBs preventing them from falling out like standard hopups. 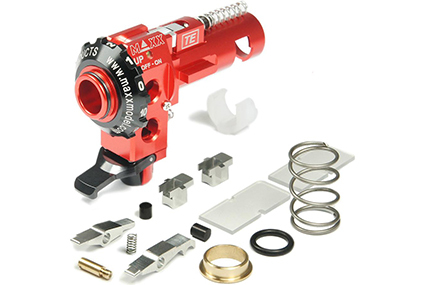 Precise tuning is the goal of this hopup unit; compatibility with most soft and hard buckings as well as the ability to utilize nozzle lengths from 20.5mm to 21.00mm allow the user a greater range of tuning and control over performance. The rotary hopup dial offers much more precise adjustments that is less prone to shifting during use compared to traditional dial style adjustment hopups. The Maxx Model TE – PRO is also designed to work flawlessly with R-hop, Flat-Hop, and Standard-Hop. This hopup is equipped with 3 O-rings as well as 3 Compression Springs on the top, bottom, and center to ensure the unit is precisely centered and straight for a proper engagement and airseal with the nozzle and gearbox.